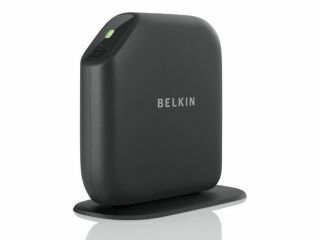 Belkin's latest range of Surf, Share and Play routers borrows an entire marketing concept from its buddies at Apple – apps. The company also revealed to TechRadar that it hopes to make more additional apps available in the future. So here's the skinny: the networking and accessory maker has launched a new range of easy-to-install routers based around the concept of having specific software applications for extra router functions. These are common tasks such as backing up your files, streaming HD and network printing. Essentially the core hardware is the same as existing routers, but Belkin hopes that its extra software (combined with the clever 'apps' marketing spin) will give it the edge. More interestingly, Belkin hopes to make other apps available in future. TechRadar spoke to Senior Product Manager Bart Bomers who confirmed the concept as something Belkin would like to make more of. "Our intention is to make more and more functionality available for these routers [through firmware updates]. We're still investigating how we want to do that." The company didn't appear to be shy in admitting the clear inspiration from Apple here, with both all the Belkin representatives present even talking up the concept and mentioning Apple in the same sentence. So the apps - Torrent Genie, for example, enables the downloading of torrents while your PC is off while Memory Safe and Music Labeller are things you access from a system tray icon on your desktop. Several models are available – Surf (802.11n), Share (802.11n), Play and Play Max. The latter models both have 2.4 and 5GHz dual-band 802.11n. Each of the different lines has a cable router and BT line/ADSL router variant with the latter carrying a £20 premium. Prices vary between £50 for the standard Surf router to £120 for the Play Max ADSL variant. They're all designed to be as easy-to-set up as possible, with clear guides and installation. The Surf models even come with all the cables ready-connected in the box! All have a UK release date of May.